Remember "Stop Making Sense"? It maybe be one of the greatest concert movies ever, in which the director Jonathan Demme showed what a genius on stage David Byrne really is. Remember the big suit? Fast forward 24 years and we have two musical legends, David Byrne and Brian Eno, working on a new album "Everything That Happens Will Happen Today". Byrne got an offer for some live shows later that year, so this legendary musician, event organizer and publisher, and once a lead vocalist of his former band Talking Heads, decides to do a tour but a bit differently. Called "The Songs of David Byrne and Brian Eno", this tour didn't include Eno (this was their first collaboration since 1981), but it did incorporate some moderns dancers and interesting choreographers. But it wasn't just dancers, David and the backup singers also got dancing roles in the show! "The fact that they decided to combine modern dance with a rock show was risky, it could have backfired quite easily. But it fits with David, since he is involved in many forms of art. They managed to pull it off through trust in collaboration." 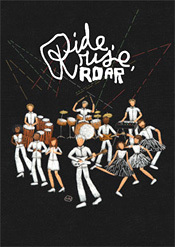 "Ride, Rise, Roar" is a film that shows us how it all looked like, onstage and ideas behind this cool production (some just brilliant things there, e.g. rules at the dancers audition: think of some short moves, repeat them; if the dancer besides you has stronger moves, copy his; the practice stops when all the dancers in the room are doing same moves). In that sense, I really liked the mixed live footage from the tour with black & white behind the scenes material, because live concert movies tend to get a bit boring after some time, especially if not done right. Luckily, this one nailed it with the aforementioned mix! PS: The film was a first feature long movie for Hillman Curtis, who directed few short movies before that. Sadly, this New York movie maker passed away last year, age 51. As a note of warning, this blogpost contains high quantity of personal thoughts, aspirations & emotions, not really connected to the photography per se, but more to the life in general. If you don't mind, do read on, please! Amazing story of a great (street) photographer Vivian Maier that was discovered and gained recognition just after she passed away in the old age of 83. Latest movie by Wes Anderson is a visual masterpiece that should be watched by photographers and cinematographers worldwide. Period. A great documentary film about New York City street photographers and a bit of street photography in general by a NY based filmmaker and photographer Cheryl Dunn. A must for all interested in street photography. A powerful documentary about Donald "Don" McCullin, internationally known British photojournalist, mostly known for his war photography, and a war junkie, as he states himself, but a true humanist in every way. With some heavy images, this movie is not for those with weak hearts, because to see some of the stuff he saw, can make you loose hope in humanity altogether. Amazing movie! Seeing this kind of story makes you believe in the human kind once again. Although not really connected with concert, theatre or stage performance photography in any way, this National Geographic documentary tells a story about White House staff photographers and could be interesting for all documentary photographers out there. A really cool and inspiring documentary film about rock'n'roll photographer Robert M. Knight, not just for music photographers, but also for emerging and even established musicians.